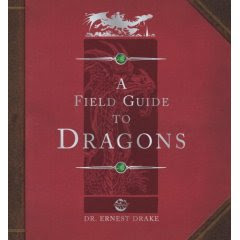 Dragonology: Field Guide to Dragons by Dr. Ernest Drake. By Dugald A. Steer. Candlewick. Copy supplied by publisher. The Good: The latest ology book revisits Dragons. The design of the book has a "serious" feel; open the cover, and you find a spiral bound book, the Field Guide, along with twelve envelopes. Open an envelope (they only look like they are closed with sealing wax), and there are the pieces to one of the featured dragons. I, of course, tried to put it together without looking at the instructions. Hint: the instructions help. Being as this is a "field guide," there is a page dedicated to each dragon (and pseudo-dragons, like the Phoenix). My favorite? The Marsupial Dragon (drago marsupialis), who lays eggs "which it incubates in a pouch on its front." Food includes koalas and wombats. Habitat: do you have to ask? As a field guide, it also includes lists of necessary equipment, such as heat-protective clothing. I love the "pretend its real" aspect of these books; that it invites you to be part of the fantasy, not just an observer. I also like how, like any reference book, this can be read however the reader wants to read it. Straight thru? That works. Skip ahead to your favorite dragons? Good idea. Examine the detailed drawings? Sweet. Okay, that's an awesomely cool concept! Very nice. I love the "pretend its real" bit too. I just finished making my mini-models. I have the big European one too. I love these series of books, you know the ology ones like wixardology or pirateology. I also found today a wand making guide which is in a simalar style of being an apprentice. Its very cool.